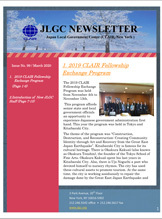 JLGC publishes semi-annual newsletters featuring articles on JETAA activity, sister city and sister state relationships, exchange programs, and local government issues in the United States, Canada, and Japan. The newsletter enables local government officials, JLGC’s fellowship program participants, and other interested persons to stay abreast of JLGC activities and research efforts. At the same time, the newsletter provides those outside of the organization with the opportunity to share their ideas and opinions. The file format of all materials is PDF.